For the fennel, if you’re curious, you taste it but not in a strong way. Heat the olive oil in a Dutch oven over medium heat. 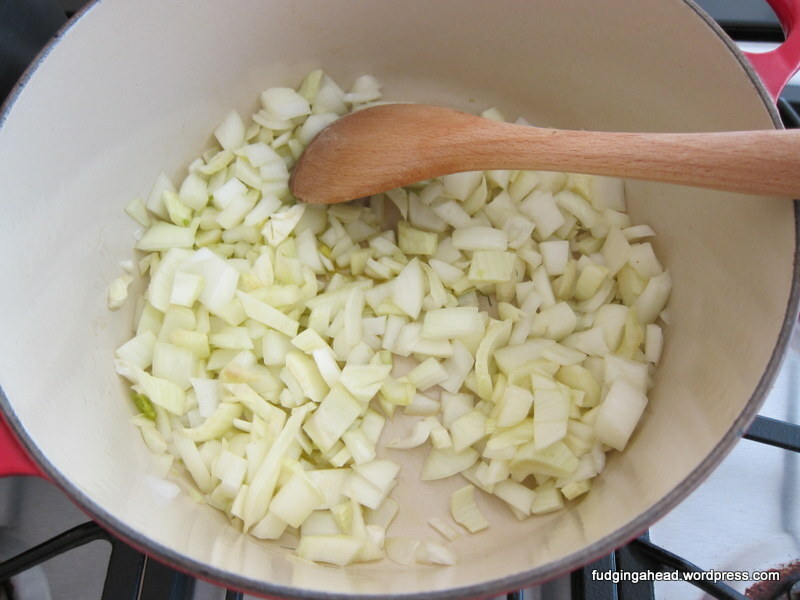 Add the fennel and onion, sauteing until tender (about 5-10 minutes). 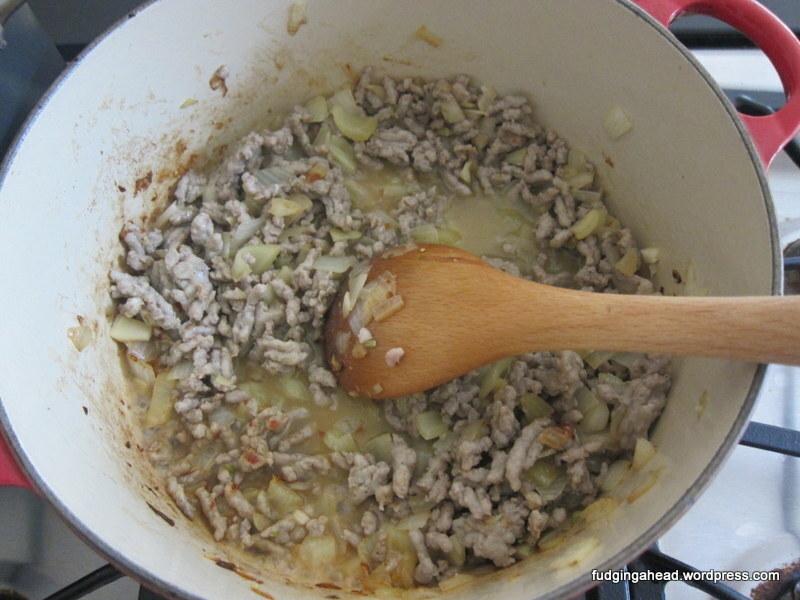 Add the sausage and cook it until browned (5-8 minutes). Add the garlic, red pepper flakes, 1 teaspoon salt, and 1 teaspoon black pepper. Cook for one minute, then add the wine and bring it to a boil. Add the heavy cream, half-and-half, and tomato paste. Again bring to a boil, then lower the heat and simmer it for 20 minutes to thicken the sauce. Meanwhile, cook the rigatoni 1-2 minutes before al dente. 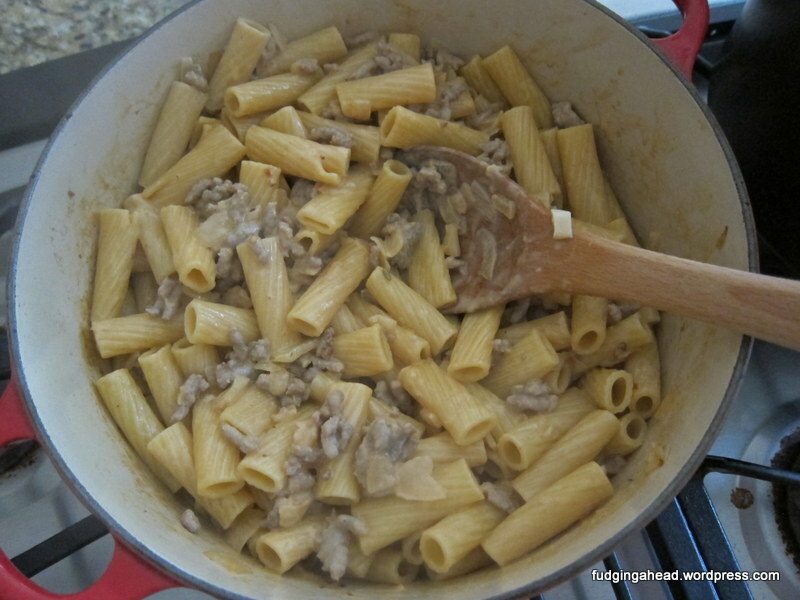 Then add the drained pasta to the sauce, stirring and cooking for 5 minutes. 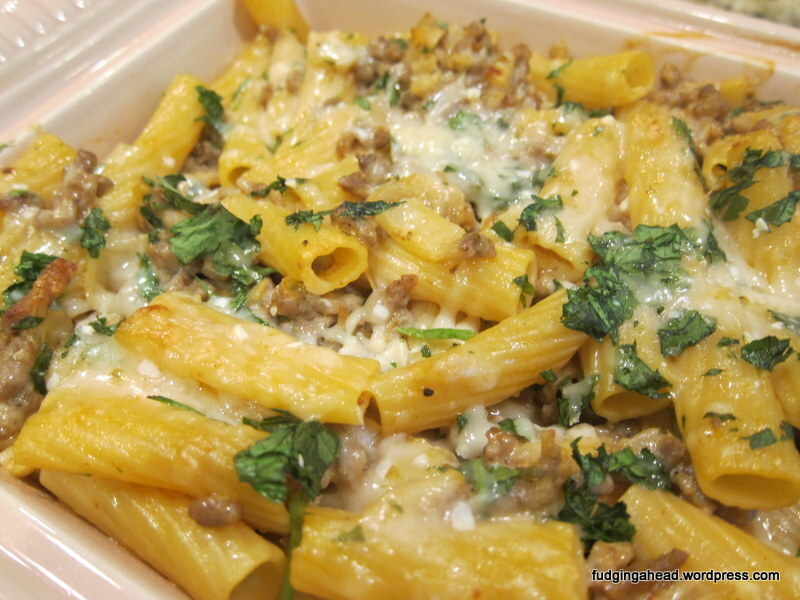 Remove from the heat and stir in the parsley and half of the Parmesan. 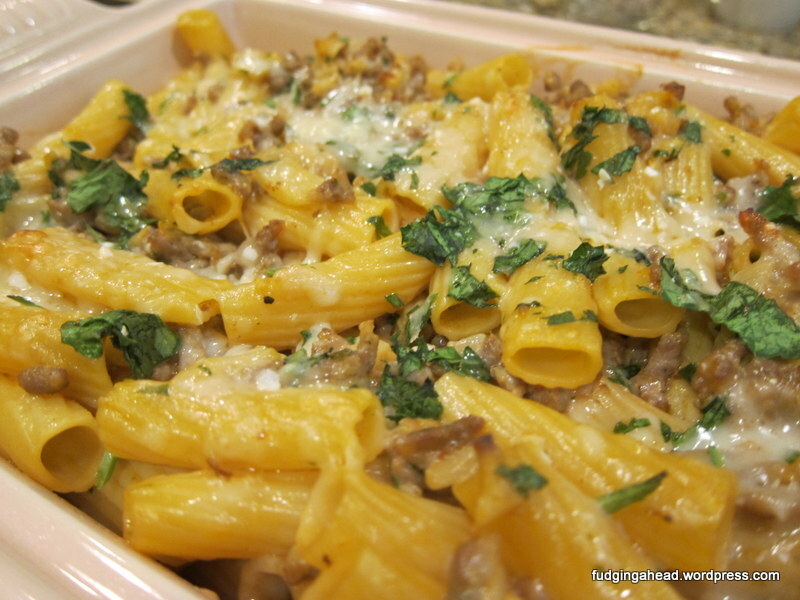 Spoon the pasta into a 9×13 inch greased casserole dish. 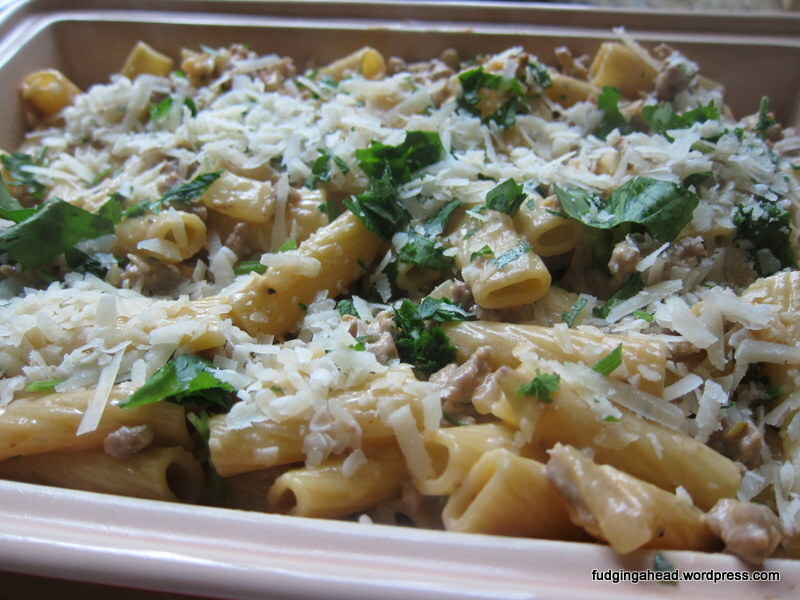 Sprinkle the remaining Parmesan on top, then cover and refrigerate for several hours up to a day. 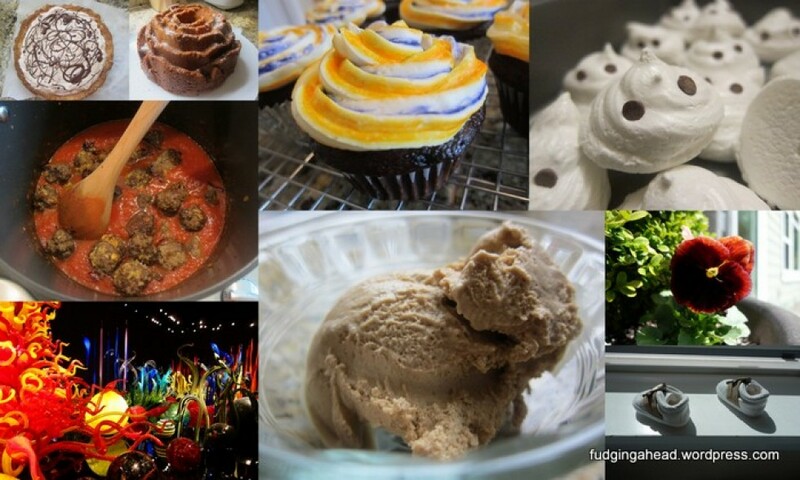 Bake for 20-30 minutes at 375 degrees F when ready. Heat the olive oil in a Dutch oven over medium heat. 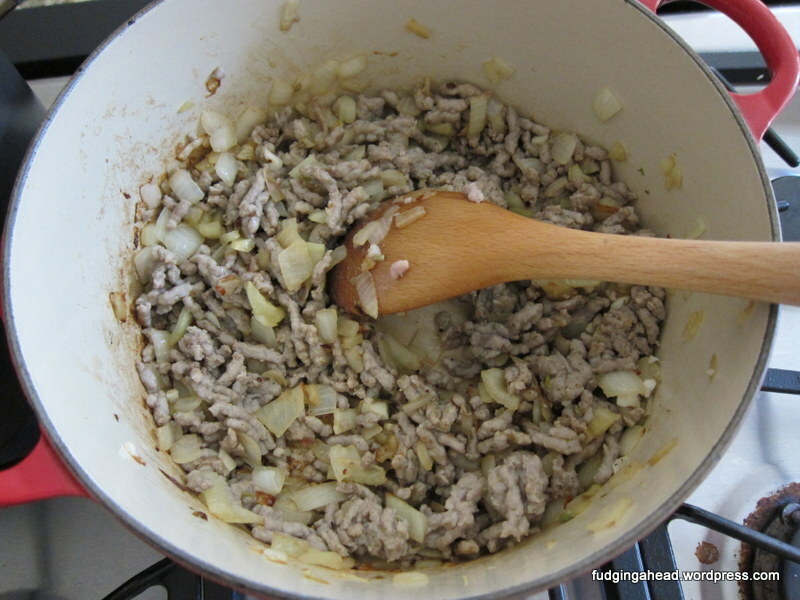 Add the fennel and onion, sauteing until tender (about 5-10 minutes). 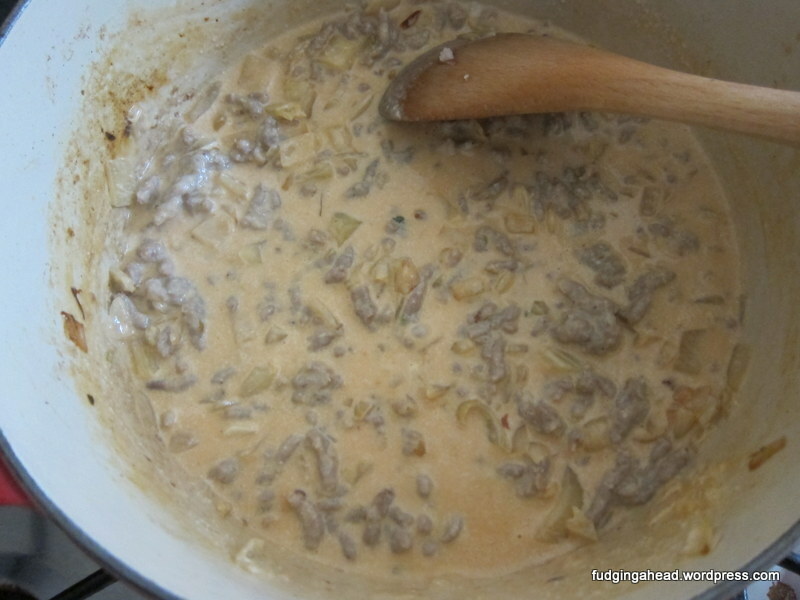 Add the sausage and cook it until browned (5-8 minutes). Add the garlic, red pepper flakes, 1 teaspoon salt, and 1 teaspoon black pepper. Cook for one minute, then add the wine and bring it to a boil. Add the heavy cream, half-and-half, and tomato paste. Meanwhile, cook the rigatoni 1-2 minutes before al dente. 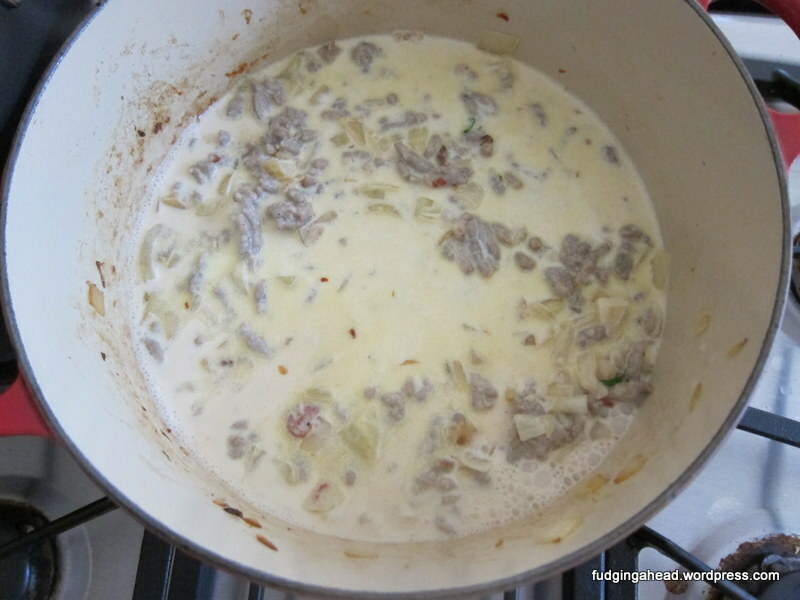 Then add the drained pasta to the sauce, stirring and cooking for 5 minutes. 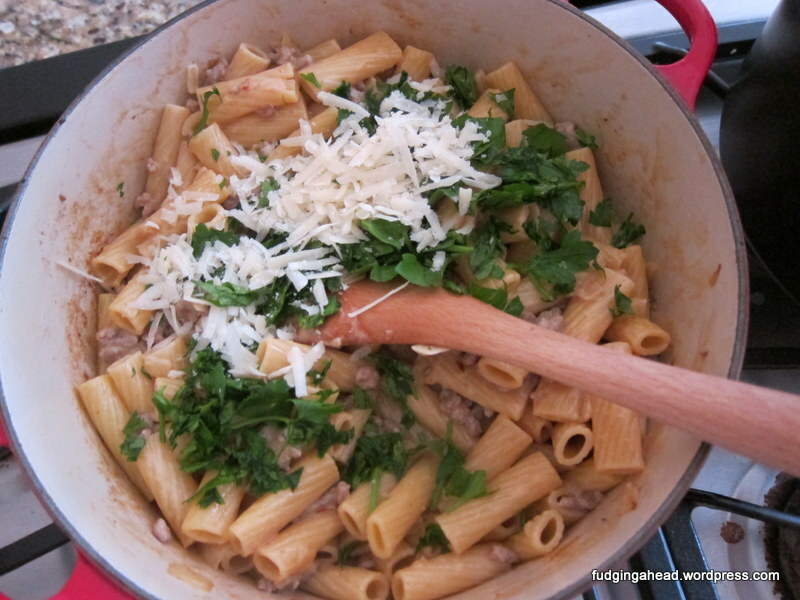 Remove from the heat and stir in the parsley and half of the Parmesan. 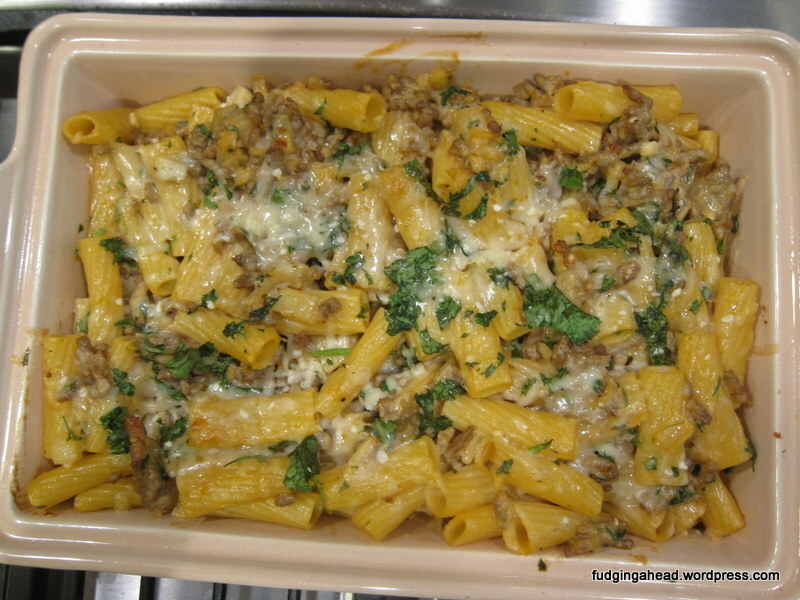 Spoon the pasta into a 9×13 inch greased casserole dish. 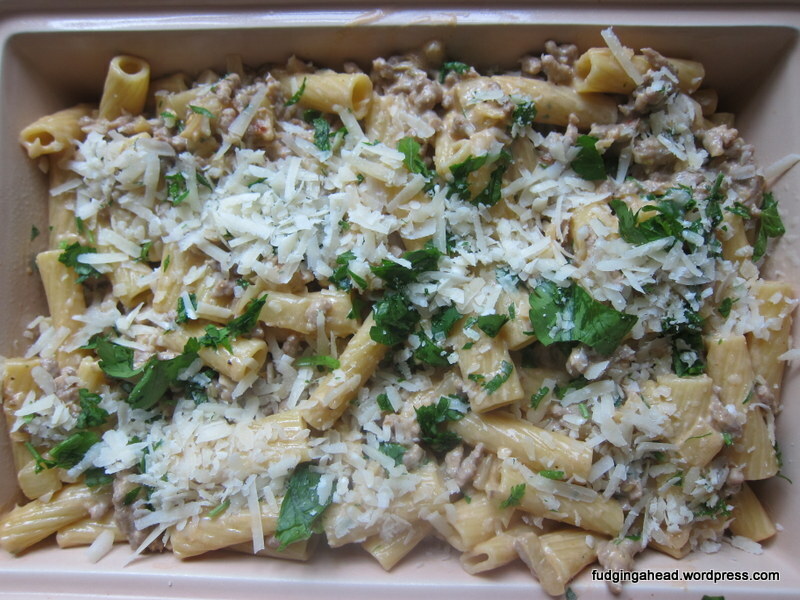 Sprinkle the remaining Parmesan on top, then cover and refrigerate for several hours up to a day. Bake for 20-30 minutes at 375 degrees F when ready.